The Million Dollar Man Ted Dibiase will be the next Guest Host on WWE RAW. The possibilities for Wrestling and Celebrity Guest Hosts are endless. Here are just a few names that I came up with of who I’d like to see Guest Host WWE RAW. First off, you must understand this new role of WWE Guest Host. The Guest Host will act as General Manager for a night on WWE RAW. The Guest Host will make matches and run the show. That said, I present my wish list of WWE Guest Hosts. Emmitt Smith – The idea for this Guest Host is to incorporate non-wrestling personalities. Anyone that has ever heard Emmitt analyze a football game on ESPN would be excited about this. I could listen to Emmitt cut promos all night long. Emmitt can even do a dance off to close the show. Put him on commentary for the night and you have television gold! Ultimate Warrior – Yes I said it. The former WWF champion is infamous for his incoherent rambling promos. I would love to see the Warrior live on WWE RAW cutting multiple promos. I understand the chance of this happening is pretty small, but I can dream right? 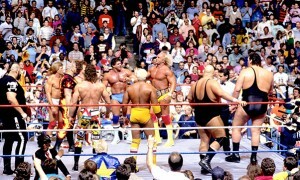 Hulk Hogan – Of everyone on my list, Hogan has the best chance of actually doing this. Jeff Peck wrote a blog here a few weeks ago suggesting Hogan as the permanent General Manager of WWE RAW. I don’t want to see him wrestle, but I would love to see him cut a classic Hogan promo. I would not be surprised to see this happen at some point in the near future. 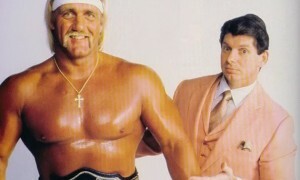 Hogan and Vince going nose to nose once again would make for some great television. Word on the street is that you could probably get him for a discount these days. Christian Bale – Have you heard his rant on the set of Terminator? The guy can cut a promo better than anyone in the WWE. I would love to see him come out on WWE RAW and just rant on everyone. Can you imagine Bale’s response when Randy Orton gets in his face and complains about Triple H? “Oh good for you!” It’s gold Jerry, gold! Tito Ortiz – Once again I am looking at people that are at the least available for the gig. Tito is available and has the Donald Trump Celebrity Apprentice connection. Ortiz is a huge wrestling fan and appeared in TNA Wrestling several years back. Tito could cut some great promos and even end the night with a knockout. An even better idea would be bringing Tito and his girlfriend Jenna Jameson as co-hosts for the night. Chyna Doll – I couldn’t think of a better way for the former WWE Intercontinental champion to return. This would be the ultimate in Train Wreck Television. Give her some cocktails and let her have at it. Could you imagine the confrontation between her and Triple H on live television? She may need subtitles, but in the end I smell a ratings success. Iron Sheik – I save the best for last. Anyone that has heard the Sheik on the Howard Stern Show knows that the Sheik is money. The WWE has greatly misused the Sheik the last few years. The Sheik usually gets a short cameo and a short promo when he appears. This would give the Sheik the opportunity to go off. Can you imagine if the Sheik had fifteen minutes of live television to cut a promo? The Sheik could go nuts all night threatening to humble guys and make man-love to them with his camel clutch. He could even charge the wrestlers $5 to talk to him as they enter his office. I predict that this would be the greatest WWE RAW in television history. Check out the WWE Legends of Wrestling 3 DVD featuring the Iron Sheik by clicking here. Order the 2009 WWE Bash on DVD by clicking here. Pre-order WWE: Allied Powers – The World’s Greatest Tag Teams on DVD by clicking here. Check out all our WWE DVD releases and EXCLUSIVE DVD packages at WWEShop!